Bergen-Belsen concentration camp near Hanover in Germany was liberated on 15th April 1945 by the British Army. Images from Belsen were shared round the world, leaving people in no doubt about the horrors of the Nazi regime. The camp was originally built by the Wehrmacht (German army) in 1940 to hold Belgian and French prisoners of war. In Autumn 1941, after the German invasion of the Soviet Union, it was renamed ‘Stalag 311’ and used to imprison 20,000 Soviet prisoners of war. In 1943 the SS took over the camp and turned it into a concentration camp for Jews, reverting to the camp’s original name. Their plan was to exchange these Jewish prisoners for German prisoners held by the Allies. These so-called “exchange Jews” usually held foreign passports or were people of note. Few exchanges ever took place. 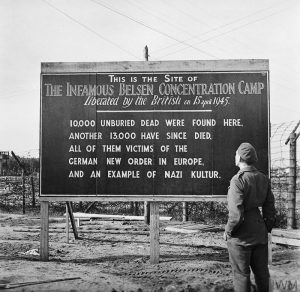 (BU 6955) A sign erected in both English and German at the camp. The camp was designed to hold 10,000 prisoners. 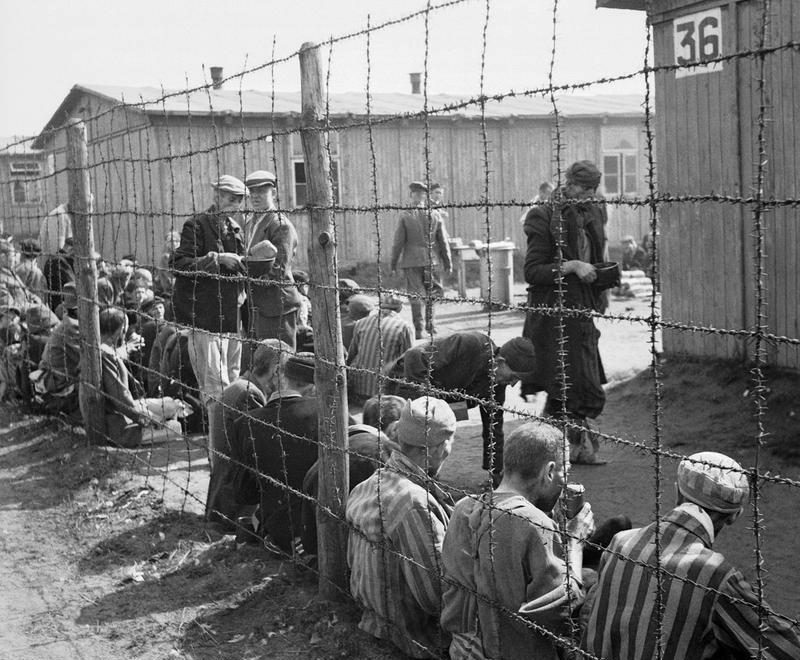 However, as the German Reich began collapsing, thousands of prisoners from concentration camps in occupied Eastern Europe were taken on death marches to camps inside Germany, including Bergen-Belsen. This resulted in mass overcrowding at Bergen-Belsen where systems could not cope with the influx. Upon liberation there were more than 60,000 prisoners in the camp. 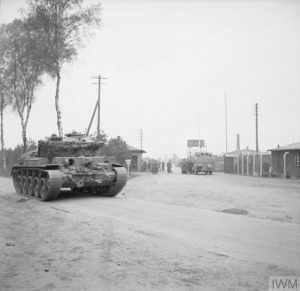 IWM (BU 3928) A British tank enters the camp gate. Over 50,000 people died at the Bergen-Belsen during its time in operation, including the teenage diarist Anne Frank and her sister Margot. There were no gas chambers at Bergen-Belsen but prisoners died as a result of starvation, disease or, in some cases, medical experimentation. Some were beaten to death by the guards. Despite the large numbers of people who died at Bergen-Belsen the camp’s conditions were initially not as severe as most others. In its early years prisoners were not used as forced labour and they were given sufficient rations. In the ‘star camp’ the Dutch Jews were even allowed to keep their own clothing, marked with a yellow star. However, due to the mass influx of prisoners from other camps during 1944, the conditions rapidly changed. An outbreak of typhus raged as the camp’s sanitation systems couldn’t cope with the thousands of new arrivals. Those that entered the camp were often given tents to sleep in that offered little protection against the weather. 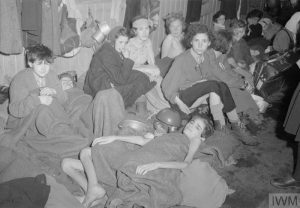 IWM (BU 3737) Women and children crowded together in one of the camp huts. The British found 60,000 inmates, many of whom were severely ill. They also found 13,000 unburied bodies around the camp. Initially they ordered the SS guards bury the victims, however they eventually had to result to using bulldozers to clear the thousands of bodies to limit the spread of disease. Even after initial liberation some inmates were killed by the remaining SS and Hungarian guards, who the occupying forces had left in charge of the camp due to insufficient manpower. Around 150 Kapos (prisoner guards) were killed by inmates on 15th April 1945. HSFA member Eugene Black was liberated from Bergen-Belsen and witnessed the killings of the Kapos. “Sunday the 15th of April 1945, 3 o’clock in the afternoon we got liberated by the British army. We weren’t aware of it, I certainly didn’t know who they were. Well the next 2 hours I will never forget because hell let loose. … Well by 5 o’clock there were 168 Kapos, what the figure I’m quoting I didn’t discover till many years later, they were killed, torn to bits by fellow prisoners. I took no part in that, I could hardly stand up”. 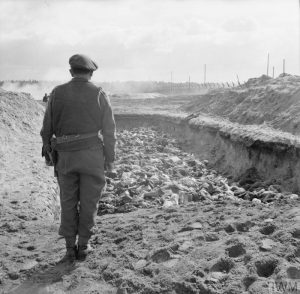 IWM (BU 4269) A British army chaplain holds a service over a mass grave before it’s filled. The British troops did their best to provide emergency care to those left in the camp. Two specialist teams of doctors and medical students were also sent from Britain. They were credited with helping to reduce the rate death from illness and starvation, however 13,994 people died from these conditions even after liberation. The British forces burnt down the original camp buildings to combat the typhus epidemic and lice infestations. 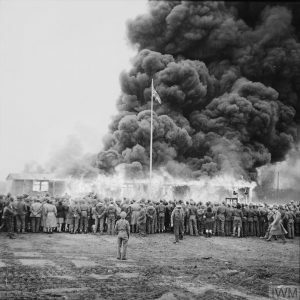 IWM (BU 6674)The last hut is destroyed two days after the camp was fully evacuated. 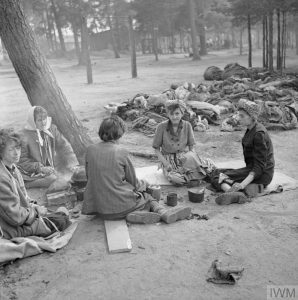 IWM (BU 3803) Women preparing a meal near dead bodies. The camp’s commandant, Josef Kramer, and senior SS supervisor of the women’s camp, Irma Grese, had remained at the camp and were arrested shortly after the British had taken control. They were tried alongside other guards in a trial that took place from 17th September to 17th November 1945. There were forty-five defendants, including Kramer, 16 male SS staff, 16 female SS guards and 12 former Kapos. Kramer had previously been commandant at Auschwitz-Birkenau, and he and others who had served at Auschwitz were also tried for their service there. The trial was broadcast widely, giving the public across Europe details about the inner workings and murder at both Bergen-Belsen and Auschwitz. Eleven defendants were sentenced to death, including Josef Kramer and Irma Grese, and were hanged on 13th December 1945. Others were sentenced to imprisonment. Fourteen defendants were acquitted. 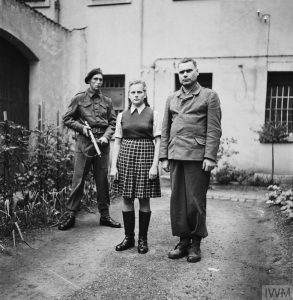 IWM (BU 9745) Irma Grese and Josef Kramer after their arrests. Today the grounds of Bergen-Belsen are a place of memorial and education. The memorial site is open to the public.